needed to create and sustain that success. photograph is of Cub Lake while hiking in RMNP. in this issue of RMOUG>Update. Congratulations! with there fellow Oracle Subject matter experts. of the best Keynotes at RMOUG in recent memory. make your Oracle Shop able to deliver to your customers. to come, thank you for attending and making this a fun and exceptional gathering..
for their Computer Science/Engineering program . under the capable and encouraging teaching of Ms. Denise Gardiner. (UCCS), and is pursuing a degree in Computer Engineering. in this issue’s Board Focus segment. for analysis, could lead to erroneous conclusions. requires an understanding of the Point of View, and the ETL process used to load data to the Hyperion applications. elevation, etc. which provide a way of describing the data’s “location”. activities and performance management processes. Microsoft Excel, Word, Outlook, and PowerPoint. Smart View is used with the Hyperion and Microsoft suite of products. Smart View ribbon in Excel then click Panel. and database then select Ad-hoc Analysis in the Action Panel. Used connection which can be accessed as a shortcut for future use. Click the pin icon to pin connections to the list. discuss each of these in more detail below. forms, and task lists once a connection is made to the data source. long list of Essbase databases but only use a few of them. a shared connection or by manually entering in a provider URL. When a private connection is created it becomes the active connection. box next to the home icon and choose Private Connections. select Add to Private Connection. – Governance Is The Key). them unless saved as a private connection. Give the connection a name and click OK.
ribbon by selecting Connections then Active Connections. database instead of the full list of applications. and the functionality available in each. are used to display data. data and the logic used is fully customizable. View will appear along with the standard MS Excel ribbons, for example. minority ownership calculations if required. by selecting the option at the bottom of the panel. • Rules Management – to update an application’s rules file. • Member List Management - member lists allow for administrators to build custom metadata member lists; i.e. a custom listing of entities, subsidiaries or departments. is very similar to that described above for the Hyperion add-ins. products such as Word, PowerPoint and Outlook. Management which we will address in our next article. categories – server side and client side. data you wish to copy. 2. Select Copy within the Smart View ribbon. 3. Open the Word document that you wish to paste the data. creating a connection as done in Excel. 5. From the Smart View tab in Word, select Paste. Follow the same steps insert data into PowerPoint. connected are the same as described above for Word. Retry Interval which we will describe below. set to an integer value of 100 or above, expressed in milliseconds. The default value is 200 milliseconds. and the default value is 600 retries. operations on socket. A zero value will result in infinite timeout. 1. In the Smart View tab, select “Options”. “Member Cells”, and then check “Parent”. 3. Right click on “Parent” to specify how to highlight the parent members. 1. In Smart View tab, select “Options”. the entire workbook, it should be in the POV; it keeps the spreadsheet clean and uncluttered, and if you need to change that member, you only need to do it once. that the user is looking at the correct intersection. In conclusion, Smart View user support requires both a functional and a technical understanding of the Hyperion environment. Smart View to access Hyperion applications. tips and tricks to help make the most of Smart View. OLAP and OLTP databases and object oriented programming languages. national conferences such as Oracle Open World, Collaborate, and KScope. software in it including Oracle 12c. show you how to quickly get VBox up and running in a few pages. can be installed in the virtual machine created including Oracle 12c. operating system to run on. on which versions work on which host operating systems. you jump in and try it in production and risk a disaster. safely, especially if all you have is a PC or a Mac available. you can take advantage of in VBox. The VBox install binary4 contains the bulk of the VBox program. from Intel Network Cards if needed. installed within the Guest OS not the Host OS. version of VBox you can find it there. inside of a virtual machine once the virtual machine is installed. install and putting them in a safe spot. same as the Mac OS X installation I’ll go through here. install but not much is different. installed inside the Virtual Machine. other types of hardware such as USB Devices etc. Host operating System vs. using the VBox Window Interface. Additions have some remaining issues for Windows 8.
virtual machines for other operating systems is very similar. and enter the required information on fewer pages (see Figure 3). drives can always be added later. of it right away. Press “create” when you’ve chosen all options. that Virtual Machines are not bootable from the network. the storage button to show the storage tree (see Figure 4). for the correct type and version of the Guest OS. must sign up for an Oracle account to do so. 11 Again, we are Jump Starting not creating Production Ready Systems. 12 After Guest Additions are installed. file that represents the OEL install CD. dialog related to VBox telling you that the mouse is auto-captured. mouse can be difficult to deal with. example, Linux 2.4 has limited support. for a operating system you plan on installing before installing it. until the full set of Guest Additions was installed. 2.6) which is fully supported for the full Guest Additions install13. have to do some research to get it to install correctly14. upgrade the Guest Additions to the matching version. Guest Additions can be installed. navigate to the network settings. other words, VBox will share the host’s network adapter for internet access. It is by far the easiest setup. must be set to the MAC Address of the Host’s NIC Card. discuss the available features of Guest Additions. modifications to work on my machine. Promiscuous Mode. I assume that this was a driver feature. start the guest and test the network. installing OEL. The first Step is to upgrade the Linux just installed. before the guest additions can be installed. that the packages will take effect. anything. The update from the menu may have taken care of all updates. make sure the new installs are complete. 15 Assuming the host’s NIC card is set to deny promiscuous mode. 16 It can also be used to install new software. 17 Unbreakable Enterprise Kernel (uek) development package. installed. The choices are few below /usr/src/kernels. one created and has “uek” embedded in the name. Copyright © 2015, Oracle and/or its affiliates. All rights reserved. Oracle and Java are registered trademarks of Oracle and/or its affiliates. to use a Oracle Universal Installer (OUI) front end? 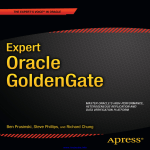 for Oracle GoldenGate 12c (12.1.2.1). sure to stop all processes and backup the existing binaries and associated files needed for your environment. GGSCI (ggtest2.acme.com) 3> stop mgr ! Sending STOP request to MANAGER ... Request processed. and as expected, click Next. After the install/upgrade is done (Image 6), we get a nice message saying that it was successful. unzipped as the Oracle user. installation is at (Image 5). thanked the organization with the following words. an Oracle DBA, while still being involved with other DBMSs. Master and Art has supported the RMOUG website since then. needs to be done and your positive attitude! performance data, which previously, with statspack, wasn’t possible without DBAs scripting and scheduling outside of the database. as part of this database management pack. snapshots, manage retention or data management. 2. Object statistics which determine access and usage statistics of both thedatabase segments. samples written to the AWR Repository. direction, to avoid concurrency issues. to focus on this SQL_ID for the investigation. to dig down a bit more into that unique SQL_ID. rdbms/admin directory for each database contain some version specific code if run from the command line via SQL*Plus. points that offer are beyond the goal of our exercise. valuable to this type of investigation. we are inspecting particular set of transactions. sample not written to the AWR could be missing an execution that would affect the outcome of the results. samples of data in the AWR Repository later on. the wait event “buffer exterminate”. statement and wait event verifies the issue. is spent on the wait event buffer exterminate. the data that is at hand. of AMM with the newest release. 1. Review the Memory Advisors in EM12c. RESIZE_OPS directly to see how often the resize is happening. Kellyn Pot’Vin is an Oracle ACE Director. mentoring fellow women in technical fields. User Group (RMOUG) Board of Directors. learned have always been useful. at work and outside work to some extent. in Oracle or move to Microsoft technologies. knew about the two different technologies. area and had a better exposure. their SQL Saturday in DU Campus. RMOUG group has helped me a lot. turning out personally to greet them. Jim Egan - ProKarma, Inc.
We are in search of solid, fact-filled technical articles which are educational and pleasant to read. are unable to fulfill this timeline, RMOUG only asks that you say so immediately so we can get assistance from other reviewers or staff. We do understand that everyone has demands in their lives and we appreciate the time offered to us by our volunteers. assistance by simply rating the article from the perspective of the typical reader. Reach A Targeted Oracle Audience • Advertise Now! 70 cents per printed magazine and even less for smaller ads. topics covered with additional information available from the supporting vendors. Door prizes are a possibility as well. of expertise with these various tools. Do you think you’d want to help with this? Send an email to [email protected] to volunteer or for more information.